This post is a guest editorial by one of our top engineering staff member. QUESTION: Which is more important with studio gear - quantity or quality? What's the use in having piles of gear in a room if half of it doesn't work? A recent excursion to the Battery Studios auction, and some stories we've heard about other studios broken gear, really drive the point home. A well-maintained, modestly equipped studio is way more valuable than a well appointed, poorly maintained one. The frustration and potential for failure during recording are not worth the glam and glitter of hundreds of blinking lights and shiny knobs. We have never been known as a studio on the cutting edge (even going back to Power Station's heyday). We've always been behind the curve with having the latest groovy toys (and lots of them). Take for instance the AMS DMX1580S. Back in the 80's this box was probably the hottest thing since sliced bread (maybe even hotter!!!). Not only was it a high quality digital delay and pitch shifter, but it also allowed the engineer to sample as well (not just in mono...but in STEREO!!!). This doesn't seem too impressive today with our 96 input, 192 track Pro Tools rigs, but back then this was simply amazing. This allowed a new level of creativity and actually saved enormous amounts of time by providing a way to "fly" parts around in a song. By this I mean sampling one section of music (perhaps a large bed of stereo background vocal parts) from one part of the tape and triggering it to record at another section of tape. Remember, back then, there were no workstations. Tape is a linear based storage medium. So there we were, in the 80's, with the introduction of a piece of gear that every pop/rock producer wants access to (if for no other reason than to brag that they are at a studio that has one). As you might imagine, demand for such an item would be high and it was certainly priced to match (I think they probably originally sold for close to $10,000). The fact that 15-year-old units are still routinely selling for over $2,500, tells you something. At the time, Power Station bought just one unit. This unit was floated and shared among the 3 or 4 rooms in the facility. Other studios may have owned one for each of their rooms whereas Power Station only owned one unit for four rooms. The point being, that at least that one unit was kept in working order and was available to any session in the building. People shared and reserved in advance. As opposed to a studio having one bolted into each room where only 2 out of 4 or 5 units may be working at any given time. Many people enter our control rooms and wonder where all the outboard gear is. Our in-room gear list is fairly lean (with the exception of Pultecs) when compared to most other world-class rooms (and yes, we have directly compared ourselves to many). What they aren't always aware of is the selection of complementary outboard we have on the second floor. Need to have a dbx 902 de-esser? We don't have one available in the room, but we can have one added to our gear complement in about 3 minutes. We engineers are an opinionated lot. What one engineer loves, the next thinks is a piece of junk. There are only a few, select pieces of gear that most of us can agree on. Al Schmitt might scratch his head and wonder why you would ever want to use something aggressive like a Pye limiter. Someone like Jason Corsaro might think that same Pye limiter is his favorite piece of gear in the room!!! It's hard to please everyone. Our in-room outboard gear selection is just enough to keep you out of trouble. Would it be nice to have six 1176's, two LA-2A's, four LA-3A's, four dbx 160VU's, two 33609's and a Fairchild 670 in every room? Sure, but with all that sonic infrastructure comes the responsibility maintaining it all (and that's just the compressor selection!!!). 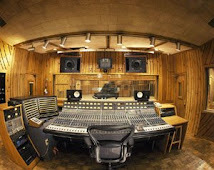 How many sessions will use that much outboard during tracking? The answer is possibly less than fifty percent, perhaps slightly more during mixing. Even still, a younger engineer might come in to the studio hoping to find a Distressor. Maybe he's just comfortable using that and feels that it would be the best choice for the task rather than one of those old classics. Perhaps, the singer has an enormous dynamic range and he made that choice due to noise figures. A Distressor would certainly have a much lower noise floor than any of these classic designs. Choice is key. Again, you can't please everybody. Having a few classic, bread and butter pieces will cover most situations. For the guy who comes in and wants 8 channels of Neve compressors.... we have floating Neve compressors. We CAN make that happen. It's kind of like building your own customized outboard rack, based on the needs and preferences of a session. Are you mixing and need access to some wacky or unique effects? Try adding some MXR flanger/phasers, the Quantec QRS, or the Accessit Spring reverb to your outboard complement. Need a ginormous reverb sound for your thunderous tom overdubs, try pulling the Sony DRE-S777 out and load up the St. John the Divine preset or even the Grand Canyon preset. Better yet, send it through one of our 2 live echo chambers first. You never know, you might stumble across something unique and new. So, while we may not have huge piles of outboard immediately visible, with a little extra setup time and advance knowledge, you too can achieve the ultimate pile of WORKING gear for your next rock session. Just a thought.